^ Beautiful little saw, I'd love one .... but they go for $700. OK, my Stihl was around the 700-800 mark, but it is a much bigger unit and it gets used quite a bit - I don't mind paying more for something I use quite a lot. Buy quality and you won't regret it. Particularly with something petrol powered. I have a Stihl it is the best saw, reliable and robust. I had a cheaper one once a McCulloch. Lasted two years and died. Also don't get a long chain bar it really is not necessary unless you are cutting some big timber. A spare chain is invaluable as is a chain file. I would recommend either a Stihl Mini Boss or wood boss range. I loves me the smell of some fresh sawdust and the gas/oil mix exhaust, especially if you're using something sweet like Castor 927. Cool crisp air is almost always part of woodcutting too. One of my fav childhood memories is from 1972, my Dad and I hitched 2 horses to a small wagon and drove them a mile or so down a gravel road to gather wood. After some instructions, he let me run the McCullugh mini-mac, I was 7 yr old, albeit for 2 minutes probably. I was hooked on the fun aspect of the tool and still look at running a saw as recreation. Lots of times it involves a couple of shots of somethin' 80 proof as a lube. 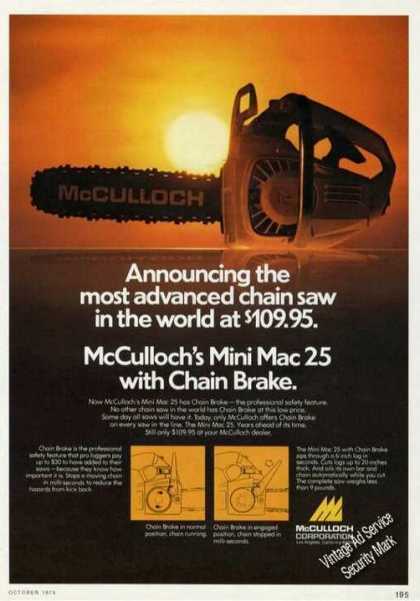 Saws have never been cheap.These ads from 1975 and 1965 show that. Cool crisp air is almost always part of woodcutting too. ^ Not the association I have! I've done a fair bit of it over Christmas - New year breaks, and that's high summer here. You can't do it on the 40 degree days 'cause of fire restrictions, but there are plenty of 32 and 36 degree days, and that's more than enough to get you hot and bothered if you are dragging limbs and throwing a saw around. Just the same, I always wear chaps (chaps - protective safety trousers filled with stuff that looks like cotton wool which clogs the saw up before it cuts the rest of your leg off; if you are using the saw on a worksite, which is where I learned it, they won't let you start work unless you are properly equipped with chaps, helmet, safety glasses, gloves, and steel-cap boots. I was taught to do it the right way, the safe way, and still do the same even though I don't do it for a boss anymore. But I kid you not, when you've been going for a few hours and it's 30-something degrees, and all your clothes are soaked with sweat and sawdust and horrible sticky gunk and you sit down for a break, it's really, really hard to force yourself to buckle those hot, heavy bloody chaps on again, never mind lace up those safety boots - which seem to have morphed into lead-lined boots on this day - and the saw gets heavier and heaver as the day goes on. My word it makes a cold beer taste good though! PS: great ads, GR! Good one. ^ Sounds very familiar .... . The beer? Or the work? But chainsaws are kinda 1 of my hobbies. Tannin, we really try not to do any saw work when the temps pass 80d/27c, just too hot. I know I should be wearing all that protective gear but safety glasses are as far as it goes. In the motorcycle world we have a acronym, ATGATT, all the gear all the time. I understand your point. All of my saw training came from using nothing but wood heat for 20+ years,thank D0g that now we only use it for supplemental use,2 yrs on a tree crew and hurricane cleanup. I'd consider myself to have been lucky so far. That said; My name is Mike and I have a saw problem. 3 Echos and 2 Huskys, a 350 and a 455. The 2 smallest Echos see the most action, having been carried on atvs and a RZR, doing mile after mile of trail maintenance. Echos are tuff, I ran over the small with a skid steer, no damage. The larger saws only get used to clean up storm damage, which is not a rarity! This is my yard today. The 1st 2 pics are of 3 trees that fell while I was out of town last weekend. We had a bad windstorm 2 weeks ago that caused widespread damage all across the county. Then we've had heavy rain every day since. All pics of my mess at home. I just haven't had time to get started yet. That little arborists Stihl would be a great limbing saw and the best size for car camping but I usually get by with just a handsaw. Last edited by Gravel_Rocks; 9th July 2013 at 08:22 PM. Gravel_Rocks, How do you find those Husky's you have? Those limbing saws are great too!